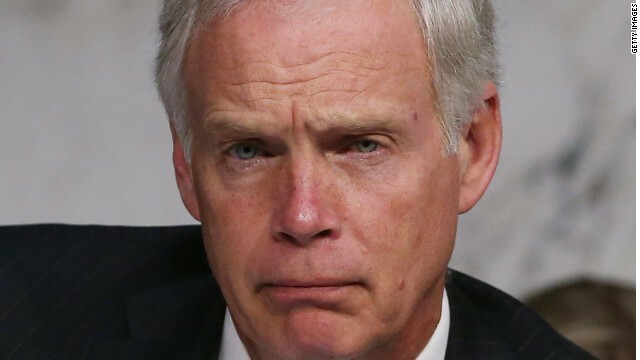 Washington (CNN) – Republican Sen. Ron Johnson of Wisconsin is waging a new battle against Obamacare outside of Congress, hiring a powerhouse attorney and filing a federal lawsuit that could reopen a debate over how lawmakers get their own healthcare. Flanking Johnson was his attorney for the case, legal superstar Paul Clement who is known for taking dozens of issues to the Supreme Court, including arguments against the Affordable Care Act. In a suit filed in the Eastern District of Wisconsin, Johnson is challenging the rules that govern how members of Congress and their staff get their health care, insisting that they should not receive any federal health benefit money and that no Capitol Hill staffers should be exempted from exchange requirements. The law essentially says that the only health coverage available to members of Congress and their staff through their job must come from the newly created Obamacare insurance exchanges. But the wording in the law is broad and the Office of Personnel Management had to issue a rule to determine how it would apply. That rule, Johnson alleges, subverted the law and opened up loopholes by allowing each member of Congress to determine which workers on their staff would be forced into the exchange and by giving thousands of dollars in employer-sponsored health benefit to help pay for the exchange policies. The issue is heavily debated within the walls of the Capitol, with others arguing that the health care law says nothing about whether the federal government should help pay for coverage or not. And while Johnson believes that lawmakers would relate to constituents more by using the exchanges with no federal benefit money, others point out that the vast majority of Americans receive employer-sponsored coverage. Like most large employers, the federal government pays for a sizable portion of the premiums for its main health benefit package – the Federal Employees Health Benefit Program (FEHBP). The ACA provision in question separated members of Congress and their staff from the FEHBP policies starting on January 1, sending them to the exchanges. If all premium support were also cut, those workers would have lost gotten what amounted to a net cut in pay. But the OPM rule allowed the federal benefit dollars to keep flowing to thousands of Hill staffers. But don’t expect this to be a Constitutional throw-down. The lawsuit’s arguments don’t address executive branch power directly. They are more technical: Johnson argues the exchange plans don’t meet negotiation requirements, that the federal government is too large to operate as a sort of small business in the exchanges and that the OPM rule violates the Equal Protection Clause of the Constitution by giving lawmakers and staff an advantage over other Americans. Not all Republicans agree with Johnson taking this aspect of the law to court. Another GOP lawmaker from Wisconsin, Rep. Jim Sensenbrenner, called the move an "unfortunate political stunt" that was aimed at attacking "nothing more than a standard benefit that most private and all federal employees receive – including the President." "Senator Johnson should spend his time legislating rather than litigating as our country is facing big problems that must be addressed by Congress – not the courts," Sensenbrenner said in a statement. "All Republicans want to repeal Obamacare, but this politically motivated lawsuit only takes public attention away from how bad all of Obamacare really is and focuses it on a trivial issue." Johnson said he will pay for the lawsuit with either campaign funds or out of his personal bank accounts. Although Johnson's lawsuit tracks with his record opposing the healthcare law, the move also helps a Republican Party focused on making Obamacare – and the botched rollout the stymied the law in 2013 – the focus of the 2014 midterms elections. Johnson’s attorney Clement told CNN the soonest a decision could come from the federal district court is “in months”. The Grassley amendment was just silly to begin with by the way. The only reason he did it was hoping that no one would agree and it would stall the process. I like that Rep. Johnson says that we all should play by the same rules. No inequality in his actions. And speaking of actions, at the very least, he is doing things legally. BO could take a page from his playbook. Bring it on "lefties"
but isn't suing in the courts what the democrats and left do all the time? why do they criticize others for doing the very same thing? oh yeah. they are hypocrites. Is this man one of those do nothing Congress who receive payment with work done zero. Why can't he start suing himself and his fellow congress people who receive salaries without doing anything. He jumps to sue Obamacare because he knows thats the issue only republicans have at heart!. Especially after they pass a bill to be included in the ACA when they already had federally granted health care insurance. If the GOP had bothered to work with the Democrats when this was formulated, then it might have been better. It is like the saying, "don't vote, don't complain." In this case, they didn't work on it, so they can't really complain until they offer their alternative. I haven't seen that. How can you work with someone, who tells them MY WAY OR THE HIGHWAY, or who locked them OUT of negotiations, or Harry Reid who refused to let ANY of the republican proposal come to the floor of the senate. How about the Lousiana bride or the Cornhuskers bribe, done by DEMOCRATS. It's like the Republicans are stuck in some sort of sick "Ground Hog Day". They keep doing the same thing over and over. I couldn't comment to you on the Christie story, but we're in agreement there as well my friend. It is only January 2014 and already we'r being fed a steady diet of all things Christie. Everyone is conveniently forgetting that the man couldn't make it past Romney's vp vetting. But that little stumbling block won't stop a viable candidate starved GOP. Amnesia and stupidity are the two things that the GOP fervently hopes it is still good at engendering and spreading. They are the only two things that would keep this near-extinct and time-warp entrenched political party alive. Stay indoors my dear friend. I hear that this polar inversion thingy is keeping you and your fellow MInnesotans in 30-40 below weather. The best of the new year to you and our fellow bloggers left, right, in the middle and the I-don't-give-a-hoots. @ Peace...read the article so you will understand the "issues" he is filing suit against. SEN. Johnson has obviously forgotten that he's filing against a change that his own party insisted on implementing, a change for which the vast majority of his party voted for. Actually, he hasn't forgotten. He's just counting on the masses to have forgotten about it, which apparently they have. Does this idiot know SC gave dictum? Pathetic sob needs to quit this game. Yes, ACA is a Law. Period. Vote this stinky pig out. Is this man one of those do nothing Congress who receive payment with work done zero. Why can't he start suing himself and his fellow congress people who receive salaries without doing anything. They're doing what they were elected to do – putting the brakes on Obama's and the left's destructive policies. They should be given a bonus. Is he up for re-election Lynda? Because if he is starting up the anti-ACA drums is THE guaranteed way to get the money rolling in from the Republican base, even though they are availing themselves of said Obamacare benefits as fast if not faster than then rest of the country. Just ask the good people of the state of Kentucky. The Koch brothers will of course be happy to flush their money down the toilet to side with anything that tries to monkey-wrench any efforts to improve the lot of middle-class Americans. voted on and passed by democrats, signed into law by obama. it's the law of the land. deal with it. That's all it is. Republicans need to deal with the fact that the PP&ACA is LAW!!! Get over it already. Apparently it's NOT the law, because President Obama has moved the deadlines over and over again,and with a LAW you can't do that. Or is that now the new thing if you don't like it or fit your needs, change it, law or no law. Another Wisconson jerk like Walker and Ryan. Great, just like the individual mandate, Republicans invented an idea, then go to court to block the idea from being carried out. The individual mandate was created by the Republican think tank, the Heritage Foundation, back in the late 1980s/early 1990s. Now Republicans pretend they had nothing to do with it. Grassley complained that Congress received help from the government to buy insurance before the ACA, so the ACA adopted the Grassley amendment to prevent Congress and its staff from receiving help. Congress then complained to Obama that its staff could not get help from the government, unlike all other employees in America (they can still get help from their employers), so Obama gave them help. Now Johnson complains that Obama gave them help. The intent of the law is to have these people-elect to go and buy through Government-Exchanges just like any one. It will not alienate, it joins to the main line people that voted for these greedy idiots of GOP, unfortunately. Here judges see intent than political stunt. He has no LOCUS-STANDI IN SUIT. SC already passed dictum, this time it will pass strictures for these GOP garbage. Let me sum up the collective opinion of Conservatives regarding ACA: "WHHIIIIIIIIIIIIIIIIIIIIIIIIIIIIIIIIIIIIIIIIIIIIIIIIIIIIIIIIIIIIIIIINE!" "Is this man one of those do nothing Congress who receive payment with work done zero. Why can't he start suing himself and his fellow congress people who receive salaries without doing anything." He should be given 40 lashes for filing suit for a provision that the right insisted upon including, plus another 40 for ignorance. "Is he up for re-election Lynda? Because if he is starting up the anti-ACA drums is THE guaranteed way to get the money rolling in from the Republican base, even though they are availing themselves of said Obamacare benefits as fast if not faster than then rest of the country." Not for two more years. He's the TeaPer dude that pushed out Russ Feingold in 2010. And yes. The brothers Koch have a fairly significant hold in Wisconsin. For how long, though? I can't yet tell. Wisconsin isn't doing all that great economically, but they are a stubborn group of folks who might not yet be willing to accept just how damaging the Koch's are to their great state. It's they who voted the TeaPers in. We'll see how it works out in 2014. Reading some of these comments – it's clear that you have no clue. He is a Republican – he is arguing that the law must apply to members of Congress as well as the public. What part of this don't you understand? He looks like he's going to cry. Gop, a bunch of do nothing winers! Big $ signs in his eyes for a win. Dude has no standing...not as an individual and not in his capacity as a lone congresscritter. Peaches is going to watch his suit get dismissed, but it'll have served it's political stunt purpose as far as he's concerned. This is not what this man was elected to do. It is him who ignores to do what he was elected for and choose to do what pleases him. How many people are going to benefit from what he is doing if it is not wastage of time and made himself get occupied doing something which will produce nothing.